Little Miss Pale Green Grime Fighter, P.I. 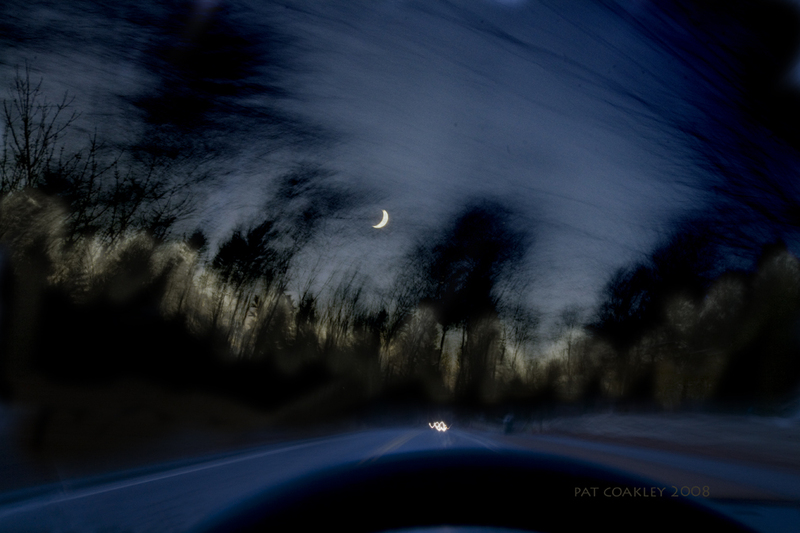 It is December 1st in New England and between 4-5 PM, night falls as the moon rises. If you are driving and brooding, there is no other place in the world you want to be. You picture is my heart. Things are worse. I wish I had faith in prayer. I do have faith in lorazepam. Lorazepam is prayer. Thoughts, too. Hold on. Very interesting effect. The bend in the trees is very Munch-ian. Not sure if that’s a word. Meh. Am in awe, seriously in awe WOWS!!! It screams winter, winter, winter, cold, ominous, yes brooding, and amazing, textural, moody, powerful, and perfectly timed. This might be one of my new favorites Pat. Hello, early bird bonnie, you know, I was hoping you’d like this one. When you get your card reader I’d like to see what moody looks like in St. Croix. On the surface, it is hard to conjure up landscape wise, unlike December in New England! But, it is there, I feel sure. A mission for you, should you choose to accept it. Sanity girl!! You are back here but in England now! Yea! I feel a bit more freedom myself just knowing that. I look forward to following your new journey! Just when I think I have found my most favorite of your shots, you go & post a new one. You never cease to inspire & enthrall me. Thank you. Yes, I did mean Munch of the The Scream…the trees are leering and provoking the viewer, howling at us. The trees and moon are beautiful! This almost looks like a photo transfer. Excellent shot. I really think you’re onto something with these blurred shots from your car. Keep it up and be very selective about what you present and I’m sure you could get an exhibition out of it. If you ever do exhibit, I think that the prints should be quite large. Thanks, Conni! Am looking forward to see your “Grime” image tomorrow. And, your story that goes with it! Ok, Mt. Brooks, I like the spin of leering and provocative trees. I’m not sure I would have thought of it that way, but now that I look at with that filter….you are right. Mikey likes it, too. Thanks for stopping by, planetross. Cool, man. Russ, I used to do a great many photo transfers so I know what you mean. Thanks. Razz, now, this is secretly what I’ve been thinking, too. So, it’s so affirming to hear you say it. What size do you think would be optimum? I agree that they should be large. I’ve been thinking of this exhibit thing, frankly, but don’t really know how to go about it. Any thoughts would be appreciated. I’ve exhibited a few times (always in group exhibitions) and from my point of view and experience, it’s been a case of who you know. I’d suggest that you start going to the various photographic exhibitions in your area. Get to know the various people involved and to familiarize yourself with the “scene”. Openings can seem a bit daunting to the uninitiated but they are quite social affairs and you’ll find the gallery owners and the photographers quite happy to shoot the breeze with a smart cookie like yourself. You’ll soon find that it’s a small world full of people who will encourage you. To get invitations to openings, visit the galleries that specialise in photography and get them to put your name down on their mailing list. It helps if they think you’re a prospective buyer. I’m not suggesting you lie, but rather, to omit. I’d make the prints really big. Like about 1m x 1.5m (about 39″ x 58″). I wouldn’t make them any bigger as it will put people off buying them because they won’t be able to fit them very easily in their homes. The size of the image isn’t just about being big, it also changes the way an image is perceived. Small images are like little jewels and large images are more like grand vistas. You’d need at least 15 “killer” images (I’d be happy to give you some guidance and involve my artist friends in criticism of your work if you wish). Make sure the prints are done on a stable paper and use inks that are “permanent”. Longevity of prints is a major concern of collectors of colour photography. Do some research into the various printing bureaus in your area and find out who can do long lasting archival prints. You also need to be able to explain what you’re trying to express with your images. For example, if I was asked to come up with some psycho-babble to go with you’re images I’d say something like, “We live in a modern world of machines we can sit in and be propelled through landscapes at high speed. As we try to mechanically and physically achieve “escape velocity” (a good name for an exhibition, I give to you) our anxieties travel with us in our minds distorting our perceptions of the world around us”. Well, Pat, you’ve outdone yourself this time. Did you know I am a dreamer? In many more ways than one. The reason I love Chagall is because his paintings are like dreams. This photo reminds me of his backgrounds, ideal for dropping in a floating goat, a bride, a farmer… you name it. This is Chagall without the floating people. Please turn this into a card for your Greeting Card Empire! Hey Pat. been away from your blog for a while, and I see that I’ve missed so much! This photo has a creepy magic to it, and the color scheme!! This Yellowish band that looks like figures dancing in the trees is the perfect complement to set all that blue around it! and what glorious energy you’ve captures here. dark and brooding…but sooooooo beautiful…it’s one thing to experience beauty, but to capture it in print…that’s one amazing thing entirely!!!! Pat- just back in the door with my computer having just been picked up from servicing- hence, out of touch for a couple of days. Had to add to Razzs’ lengthy and so right on discourse about marketing yourself and your photos. The smart cookie part is the door opener. The portfolio would be the clincher. Really Pat, your work as individual photos, creates thought, mood, and singular vision. When I scan over your home page with your multiple images in stamp size, I’m struck by how powerful every one of those shots are. They need no titles to make you think. but an exhibition of your work, large scale is a level of appreciation they and you deserve. Catching up…….. got the card reader today too. Lots to do. In reverse order I go…hey, that gives me an idea! Photos while driving in reverse! Kidding, people, Kidding. Bonnie, yea! to your computer being back and card reader replaced. Yes, you’ve got lots to do and I am looking forward to seeing your new painting. As always, your words help me see possibilities and even given me some language to think about things. One of the things I know is that this set of images do need scale to be appreciated fully as Razz pointed out. I have felt that myself. Maybe I’ll try enlarging one to the size he suggests and go from there. This advice and encouragement is a gift to me. Fickleinpink: I’m so glad you returned and there’s nothing pink in the photo! Appreciate very much your response. As you can see from other comments, I’m trying to figure things out and reader responses have been very helpful to me. Nava, you know…that comment about energy hits the nail on the head as to why I have enjoyed this series. The motion does indeed give the image just that. Thanks for articulating it. Now, epic, this is fabulous. Oh, why didn’t I think of inserting a floating goat!!! Honestly, Chagall? You are my favorite blood ostrich feather sausage eater. Razz, what can I say to you except thanks? I take you up on everything you offered! And, that psychobabble? Seriously, I had no idea you were so full of it. Oh, that sounds bad. Full of Psychobabble, I mean! Escape Velocity. Beautiful. Lessanx. Hilarious. You cover the spectrum and I’m grateful. Dear Pat, You ROCK! Seriously. Thanks, palminao. I am glad you dropped by to see twilight in New England!